I see gorgeous lingerie all the time, but every once in a while I’ll see something so beautiful and so unique that I can’t stop thinking about it. 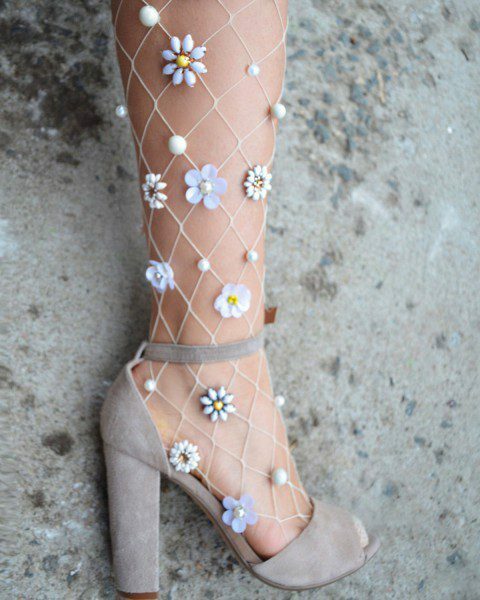 A little over a week ago Marionette Mew shared these embellished tights over on Twitter and I’ve been obsessing over them ever since. Tell me these are not amazing?! The tights are hand decorated in New York by Lirika Matoshi, who opened her Etsy store last year and has already been featured on ELLE Brasil. The product descriptions are next to non-existent with no sizes to choose from, so I’m not sure what size range the tights are intended to fit, but as always with made-to-order lingerie there’s a good chance of the designer being able to accommodate your needs if you drop her an email before purchasing. 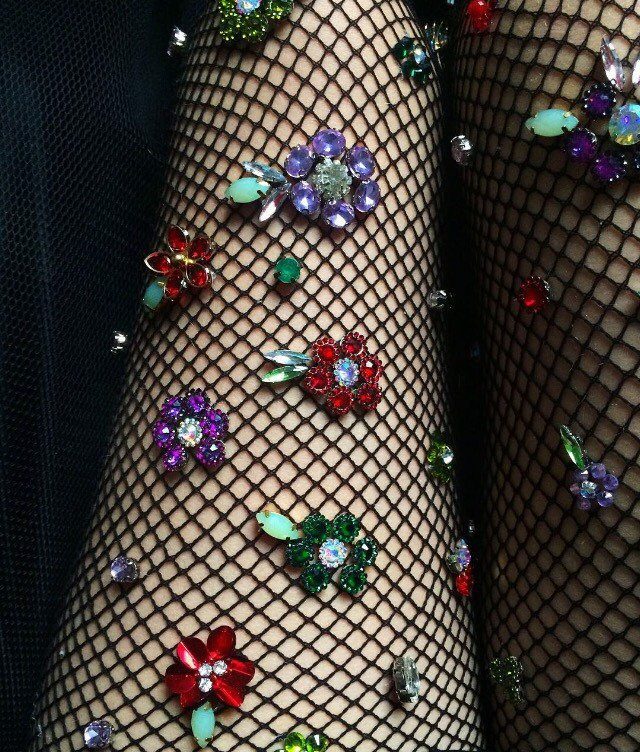 Taking her inspiration from nature, the fishnets mostly feature floral motifs and little, bewelled bugs. My favourite pair, the Green Wall Net design above, are a beautiful recreation of green leaves wrapping their way up a wire trellis. Other designs feature sparkling stars, inspired by the twinkling night sky perhaps? Intricately embellished with a mix of embroideries and glittering crystal beads, in some cases hundreds of them, these tights are almost certainly really delicate. A lot of luxury lingerie is though, and you probably wouldn’t wear these very often (or maybe you would!). If you’re putting together an outfit for a special occasion and are looking for a dazzling fashion accessory that is sure to turn heads and elicit endless compliments, Matoshi’s tights are a sure bet. I wouldn’t be surprised if we see these worn on stage at some point, they have that kind of over-the-top, showgirl appeal to them. Being hand-embellished in what I assume is a very long and laborious process, prices start at $150 (~£120 / ~141€) and go up to $200 (~£160 / ~188€). Other accessories such as socks and chokers are also available. What do you think of Lirika Matoshi’s embellished tights? Which are your favourite pair? These are gorgeous ! I wonder if there is a way to achieve a similar look doing it yourself. With the right glue I’m sure you could, though it seems it would be a very precise and arduous task!